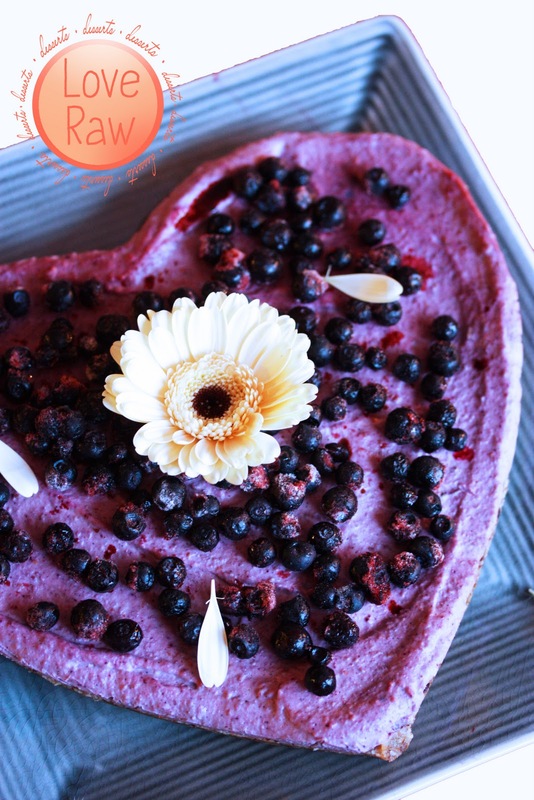 Love Raw: Valentines Cake recipe! Hi you people of bewinged hearts! 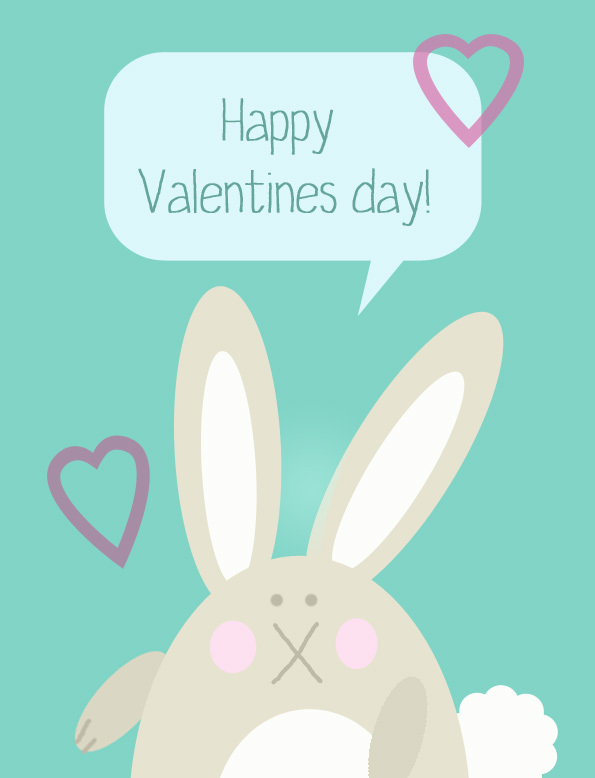 I hope you have a nice and romantic day with jummy goodness. 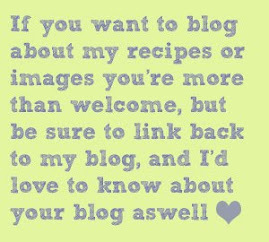 If you don't I've posted a little cake recipe for you to enjoy. 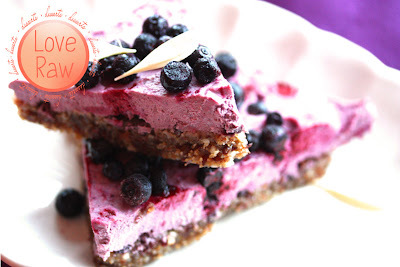 If you don't have the ingredients at home for the moment, I can assure you that it is tasty the other days of the year too :) You'll make this cake in a matter of minutes. Let it then rest in the fridge for 1-2 hours or until firm. If you cant wait, pop it into the freezer for a while to firm faster. good enough to eat as it is (for a Swedish recipe, look further down). The strawberry layer comes from one of the cake recipes in the dessert ebook that will be launched any day now! I put blueberries on the cake for the actual photoshoot, but ignore that, it's supposed to be black currants. In a food processor, grind the walnuts and almonds into a flour. Add the rest of the ingredients putting the Cacao nibs in last. Now you have a dough ball. Take a cake pan and put some plastic film in it so that it covers the bottom and sides. Press down the dough ball with your hands and form a nice base. Use a spoon to even the surface. Don't work the dough up along the sides as if it were a pie. Only cover the bottom of the cake pan. Continue with the raspberry filling! In a food processor grind the cashews to a fine flour. Add the rest of the ingredients but the Coconut butter and the Sunflower lechitin. Process until completely smooth. Can require up to 5-10 minutes of mixing..
Now add the Coconut butter and mix some 30 seconds more, and then add the Sunflower lechitine and process for another 30-60 sek. 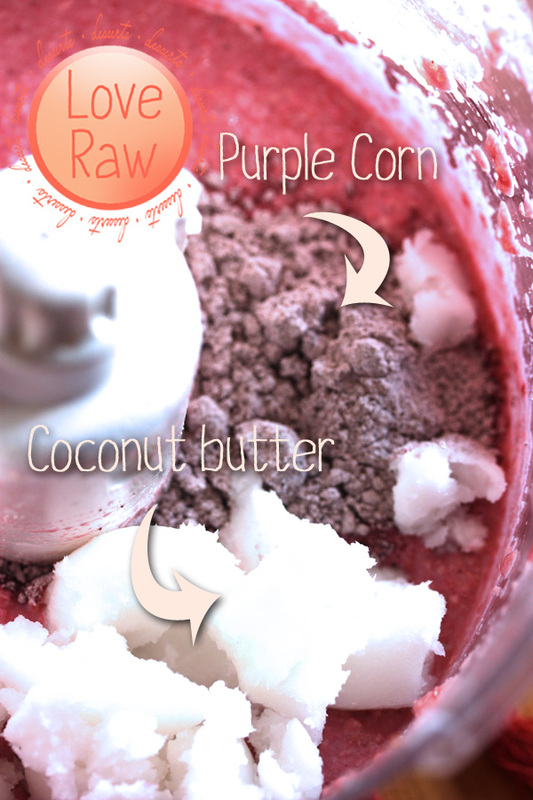 If you don't have Purple corn or Sunflower lechin at home, it's still going to be a tasty filling. 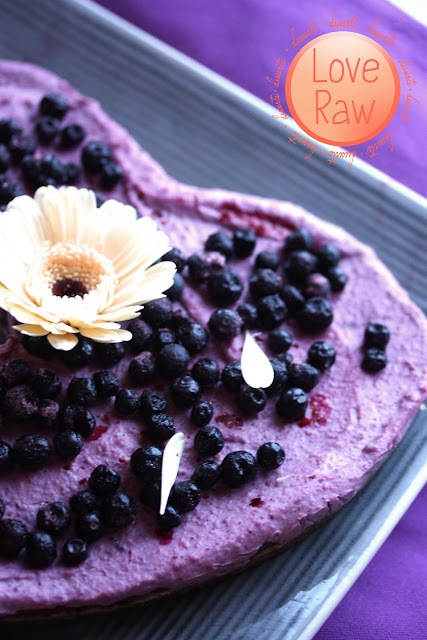 Pour the raspberry filling over the crust and top the cake with lots of black currants and a pretty flower. Put in the fridge to harden for 1-2 hours. Before serving, lift the cake by holding the plastic film and carefully remove the film by supporting the cake underneath with a spatula or some kind of flat tool. About black currants... I love to take some branches in the winter and put them in water. After a week or so the buds crack open and you see a bit of green leaves. The wonderful thing about this is that you can then smell the wonderful scent of the black currant, wich put you instantly back to lazy summerdays in the middle of the winter. Black currants are full of antioxidants (twice as much as blueberries), vitamin C (four times as much as in oranges), essential fatty acids (GLA a very rare omega 6-fatty acid) and minerals like potassium (twice the amounts of bananas). 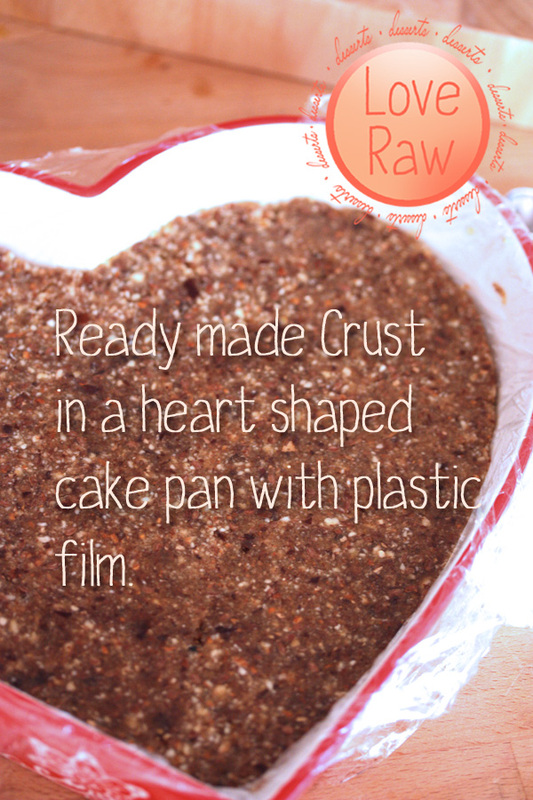 • Is raw and free from chemicals (compared to the soy lechitin). 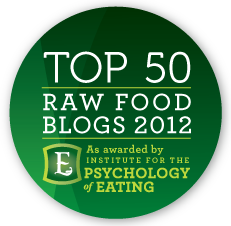 • Lechitin is an essential nutrient that people can be deficient in if they don't eat eggs. • Lechitin contains choline, which is good for pregnant women, as it helps the baby to develop. • Choline also enhances mental focus and physical endurance (it has been used to treat dementia). • It strengthen the gallbladder (can combat gallstones) and heal the liver. • To improve the cholesterol levels in the body, the bad LDL cholesterol needs to be reduced and the god HDL cholesterol increased. This is what a lot of nuts do, and also lechitin. • Lechitin helps to break down fat molecules into smaller parts. The body can then use the fat for energy instead of storing it as body fat. • Improves male sexual performances. • Sunflower lechitin is a prebiotic = food for the good bacterias in your gut = stronger immune system. • Brakes down plaque in the blood vessels. Have a lovely Valentines day!! Om du vill grodda valnötterna och mandlarna först går det utmärkt. Kör alla ingredienser i en matberedare tills du har en degboll. Klä en pajform med plastfilm, och tryck ner degen jämnt och fint med händerna. Använd en sked för att jämna till ytterligare. Om du hellre vill ha kakan i en form med löstagbar kant går det också. Fortsätt med hallonkrämen! Gör först ett mjöl av cashewnötterna i en matberedare eller elektrisk kaffekvarn. Tillsätt resten av ingredienserna utom cocosoljan och solroslecitinet och mixa till en mycket slät kräm. Tillsätt därefter cocosoljan och solroslecitinet och mixa ytterligare någon minut. Beroende på hur kraftfull matberedare du har, så kan mixningen med en mindre kraftfull maskin ta 5-10 min för att få en slät kräm. Häll hallonkrämen över kakbottnen och ställ kakan i kylen över natten för att stelna, eller i ca 5-4 timmar. Looks nice and yummy. Thanks for sharing the recipe. I will surely try this out. Take the Cake Personality Test and find out which cake are you like. I have taken the test and have enjoyed a lot. Hope you too will enjoy it. Have Fun!! 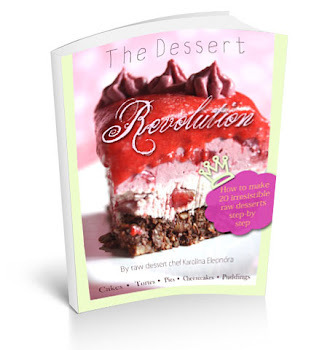 I have a book full of recipes with raw food. I tried a few and they are really nice. Thank you for accepting my friend request. I am looking forward to your new posts. This one really looks perfect!! 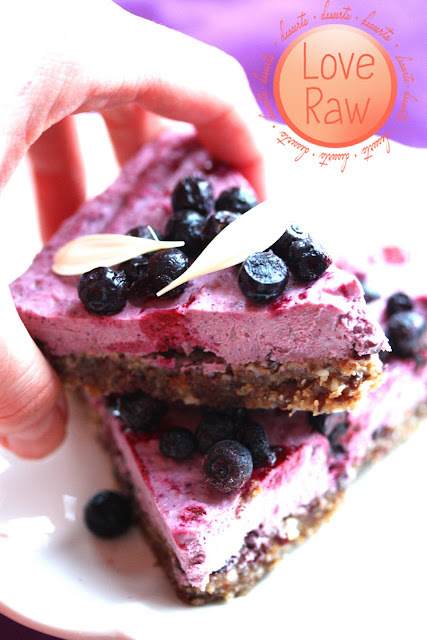 Your raw food looks amazing. I love the feel of your blog. I look forward to following you and all of your yummy treats. Peppen: lustigt att du nämnde det. 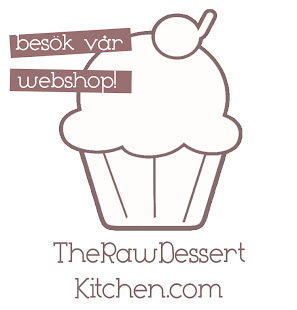 Tänkte lägga upp en liten banner om att man får låna recept o bilder från min blogg om man bara länkar tillbaka, så ja gör gärna det! När släpper du din nya e-bok förresten? IDAG! :D Gud vilket pill det har varit... Känns nästan overkligt. Jag lägger upp en liten bild på mini-eboken till höger i bloggen, den kan du använda också om du vill. Ha en underbar helg Maria! Karolina, you KNOW I will take the recipe of that chocolate cake, when I visit my girls! !